The 2011 Bobcat Club Caravan is coming to a location near you this month. All alumni, Bobcat Club members, fans, and supporters are invited to attend these free events and visit with Ohio Athletics staff and coaches. The event is fun for the entire family and includes free food, insider updates and prizes! Coach Frank Solich and Coach John Groce are confirmed for both the Akron/Canton and Cleveland Bobcat Caravans, so you can get updates on the OU football and basketball teams and ask questions about plans for the upcoming seasons. These events are free, but please register online with the OU Alumni Association. Links are posted below. For more information, contact Rob Norris at 740-593-1999 or norrisr1@ohio.edu. Wednesday, May 25, 6 to 8 p.m.
Thursday, May 26, 6 to 8 p.m.
A few musical groups with OU/Athens connections are coming to Northeast Ohio in the next few weeks. Enjoy! McGuffey Lane will be playing at the Winchester Tavern and Music Hall on Saturday, April 2, at 9:00 p.m. Tickets are $15. For tickets, call 216-526-5103. The Ohio University Women's Chorale comes to Lakewood on Friday, April 8. The performance at Lakewood United Methodist Church begins at 7:30. The concert is free and open to the public, although donations to the group are accepted. For more information, contact Marj Ruhl (mjruhl@aol.com). Show your school spirit on April 14 as part of OUr Day. To learn more about OUr Day, click here. If you need some new OU gear, you can save 20 percent at the Bobcat Store through 3/31. Use the code OURDAY at checkout. 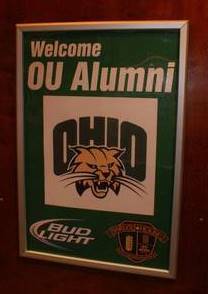 If you have ideas about what Bobcats in Northeast Ohio should do to celebrate OU — Have a happy hour? Participate in a community service project? — please share them in the comments. The Ohio University Green and White Club presents the 36th Annual St. Pat’s in the Flats at the Barley House on Saturday, March 12. All OU alumni and friends are welcome! Get complete details here. 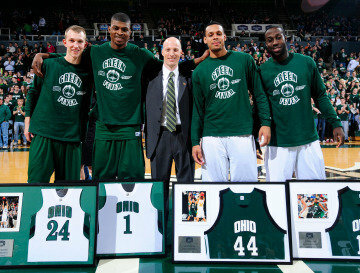 Join OHIO alumni and fans in Cleveland for the MAC tournament, March 10-12. OHIO faces No. 4 seed Ball State @ the Q Thursday; game should start around 9:30 p.m.
Basketball game tickets will be $32. Visit www.ohiobobcats.com or call 800-575-CATS for tickets and information. A Bobcat Bash, including free appetizers and happy hour-priced drink specials, will be held two hours prior to tip off for all OHIO men’s MAC tournament games at Zocalo Mexican Grill and Tequileria. For more information on the MAC Tournament at Quicken Loans Arena, including game times as the tournament progresses, click here. Ohio's basketball teams may be coming to Cleveland March 10-12 for the MAC Tournament. Check OhioBobcats.com for game times, ticket information, and details on any pre-game events.